Et Verbum: How Christ said the first mass, By Rev. James L. Meagher, D.D. Part 3. 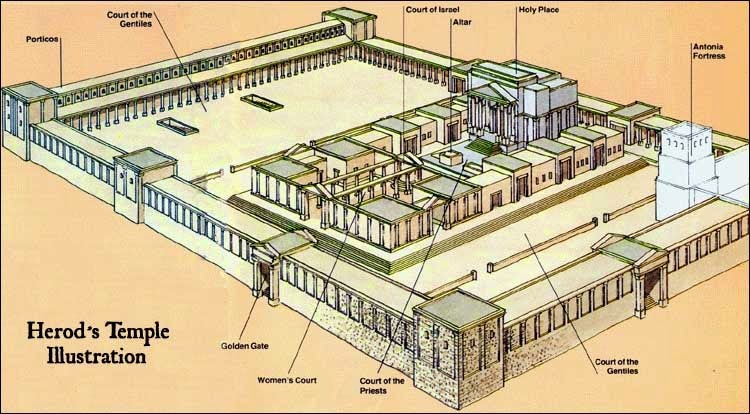 Directly east of the Holies, the three Courts of the Priests, of Israel, and of the Women—formed one great Court, divided as the names suggest. In the middle of the Priests' Court, now called the Es Sakhra "the Rock ", where Abraham offered his son Isaac, rose the great sacrificial altar foretelling Calvary and its Victim the priests were to sacrifice that fatal Friday. To still more precisely typify Calvary, this altar was made of unhewn stones, built into four walls on the outside, the stones being held together by leaden bands, and the interior filled with earth. This ever-burning fire, which had come down from heaven, in these three places on the sacrificial altar imaged the Shekina as fire and cloud on the mercy-seat. 2 One fire was to burn the flesh of the animals, the other was for the incense, the third to light the other fires if they went out. The roasted flesh was removed each day; but the bread and wine on Saturday were taken from the Holies and laid on a table for the priests to eat and drink. At the north of the altar stood the incoming priests chosen by " lot," and on the south stood the outgoing clergy, who had finished their duties for that week, the latter took their portions of bread and wine; in the center stood the high priest, and as the outgoing priests passed, they gave him half their portion of the proposition bread. The bread could be eaten and the sacred wine partaken of only on Saturday by priests in a state of Levitical purity, to foretell that only priests free from mortal sin must partake of Communion. At the north of the altar rose six long rows of stone pillars, each about nine feet high, having near the top four rings to which they tied the bodies of the victims while removing the skins. Near-by were eight lower stone pillars, with hooks on which they hung the pieces of sacrificial flesh. Near-by were a marble table for laying out the pieces, a gold table for sacrificial vessels after the service, and another silver table on which they laid the victims before the services. The Temple places we have described called the Chel "The Sacred Place," was surrounded by the Choi "The Profane." There the Gentiles could worship. But they were forbidden under pain of death to enter farther in. Greek, Latin and Hebrew bronze tablets on the surrounding marble balustrade, some of them found in the ruins in our day, told them the penalty of entering beyond. This Profane Place represented the Heathen nations not yet called to the Church till the Apostles went to preach to them. This is the reason every Catholic Church has a porch representing the heathens and infidels. Now let us see the origin and history of these sacrifices of the Jewish Church. The grand liturgy of the Temple, the sacrifices of the Hebrew Courts have passed away, for the Sacrifice of the cross they foretold has been accomplished, while the sacrifice and ceremonial of the Holies, foretelling the Mass, still continues in the Eucharistic sacrifice. But ages of education and revelation were wanted that mankind might understand the cross and Mass. When the world was young, divinely directed patriarchs formed the ancient Passover, unfolding mystic rites, which Moses developed into the tabernacle ceremonial, which David and Solomon augmented into the Temple service, which the Jews introduced into the synagogue, and all these Christ fulfilled, finished and changed into the Eucharistic Sacrifice at the Last Supper. In these ceremonies and prophecies, most minute details of the Incarnation, the life of Christ, the history of his sufferings and death, were written by the finger of God, that the Apostles might know him, and that the nations might enter his Church. In the infancy of our race God taught our fathers as you would teach a child. Words were few, writing was not known. But religious truths might be seen in surrounding objects. Whether God revealed the nature of sacrifice to Adam or if he knew it in his state of innocence we know not. But in the infancy of our race, they offered animals and first-fruits to God, to whom all belong, in place of their own life. The father priest might tell his children the story of creation, of the fall, of the foretold Seed of the woman, who was to come and restore mankind to innocence lost in Eden, but the words would be soon forgotten. The father chose a lamb as the chief sacrifice, representative of the Redeemer in his passion and death, 6 that the gentle innocence and purity of the animal might foretell the same in Christ. Whence down the pages of the Old Testament, and in the Temple sacrifices, the lamb immolated morning and evening was the chief sacrifice—all others were only accessory. What more impressive scene and prophetic type could have been given, than the young lamb, sinless, mute, chosen from the flock and condemned to die ? The father, head and priest of the family, leads the victim to the altar, while round gather in prayer, wife, children, servants. Its feet are tied, it is thrown on the ground, its throat is cut, its warm blood flows, its skin taken off, its body roasted on the fire, its flesh is eaten while flame and prayer ascend up before the Lord. There was a prophecy of Christ's arrest, flagellation, crucifixion. 7 It was a sacred poem, written not in cold words, but by the Holy Ghost in acts, signs, symbols, and mystic movements, teaching in striking ceremony truth to minds of men when the world was young. But people say. Who were these children of Adam? For the Bible mentions only his two sons, Cain and Abel. Jewish writers tell us that thirty-two times Eve brought forth twins, a boy and girl at each birth, and the twins married. The names of only two are given, for these related to Christ. They say Cain " Acquisition," married his twin sister Ripha " The Wanderer," 8 and that Abel " Passing away," born without a sister never married. These statements of Jewish writers are to be taken with great care, but we give them and let the reader judge for himself. How often Adam and his sons sacrificed we know not. 9 But in the year 129 or 130 after the fall. Holy Writ says Abel, a shepherd, offered the firstlings of his flocks, the lambs, for he was liberal and generous with his Creator. Cain, a farmer, was close and stingy, and loving worldly things, he offered the poorest and the most worthless of his farm products. For these reasons God received Abel's sacrifices and rejected Cain's. Jealousy, the fiercest passion, human or demoniac, rose in Cain's soul, and he killed his brother. Talmudic writers say, that filled with frenzy, he hacked his brother all over, covering him with wounds, in his ignorance trying to make a hole through which, his soul might pass out of his body.
" The voice of thy brother's blood crieth to me from the earth. Therefore, cursed shall thou be upon the earth, which hath opened her mouth to receive the blood of thy brother at thy hand. When thou shall till it, it shall not yield to thee its fruit; a fugitive and a vagabond shalt thou be upon the earth. And the Lord set a mark upon Cain, that whosoever found him should not kill him. And Cain went forth from the face of the Lord and dwelled as a fugitive on the earth." 13 The names and history of the other sixty-two children of Adam are not given, because they did not relate to Christ. Every offering of the Hebrew religion foretold Calvary and the Eucharistic sacrifice, as St. Paul says: " Every priest standeth daily ministering the same sacrifice, which can never take away sin. But he, Christ, offering one sacrifice, forever sitteth on the right hand of God." 15 "Christ was offered in a lamb to show his innocence, in a calf because of the merits of his cross, in a ram to foretell his government, in a goat for he bore our sins, in a pigeon and dove because of his two natures, or in a pigeon because of purity, and in a dove because of his love of man." The lamb with bread and wine were sacrificed from remotest history, all other offerings were secondary—one foretold the crucifixion, the other the Eucharist; they were always intermingled, mixed in mystic ceremony foretelling Christ's one sacrifice, of Calvary and the Mass which form not two, but one act of divine worship. Before he came they foretold his coming in the future. After he came the Eucharistic sacrifice points back to him. One majestic sacrificial ceremonial went before him in patriarchal, tabernacle, and Temple worship, telling that at a future age he would come to fulfil their meaning. Another still more magnificent ceremonial, the Liturgy of the Church, coming from the Last Supper, shows that He came. One pointed in the future, the other to the past, to the Tragedy of Calvary. Let us see what is a sacrifice. Abraham, Isaac and Jacob built altars, offered sacrifices with the bread and wine of the Passover worship. Jacob with his sons went down into Egypt, became slaves in the Nile land, dwelled there till God, in the form of the Shekina, called Moses from the burning bush to be their deliverer. For forty years he led them through the vast deserts of Arabia, "The Sandy." Amid the fearful thunder and lightning of Sinai, while the earth quaked and the Shekina covered the mount, God gave the Ten Commandments, foundations of all laws of civilized countries. The Lord then developed the patriarchal Passover into the elaborate ceremonial of the tabernacle and Hebrew religion. Down to the days of Moses the father was the priest and offered sacrifices for the family. Thus, in patriarchal days, fathers, heads of tribes, princes, kings, revered, feared and loved of subjects, offered sacrifices that their personality might excite reverence, devotion and religion in their subjects. Thus monuments of Assyria, Persia and ancient nations show us the priest-king in sacerdotal vestments offering sacrifices for the nations they ruled. Only beasts of the " clean " species, as the sheep, cow, and goat, with birds not younger than eight days, nor older than three years, without blemish, were sacrificed; the sick, castrated, lame, blind, etc., being rejected, for they foretold their great Antitype, the sinless Christ sacrificed in the fulness of his mild and gentle manhood. On great feasts after the sacrifice of the lamb countless animals were immolated, the blood of each splashed on the four " horns" of the great altar. The Temple was a vast shambles, a great slaughter-house of innocent victims, to shadow forth the awful, terrific sufferings of the Victim of Calvary. The blood was poured at the base of the altar, and flowed down through an underground passage into the Cedron " the Black Valley," thus named because of the blood. While the bloody sacrifices foretold the crucifixion, the unbloody offerings, the Jews call " flour" and " drink offerings," pointed to the Mass, where in an unbloody manner from the rising to the setting of the sun he is offered now among the nations. Wheat, barley, flour, chalices of wine, cakes of unleaven bread, azymous "thin," were offered with every sacrifice. 1 Edersheim, Temple, 32, 83. 3 Edersheim, Temple, 33; Talmud, etc. 6 S. Thomas, Sum. 3, q. 23. 7 S. Augustine, Sermo. xxxi De Pasch. 1 11, 111, xxxii. etc. 8 Dutripon, Concordantia, S. Scripturӕ, word Cain, who quotes S. Chrysostom. 9 S. Thomas Sum. Theo., 2. 2 q. 85, 1 ad 2. 10 S. Augustine, De civit. Dei., L. xv., c. vii., L. xviii, xvii. 11 S. Augustine, contra Faustum, L. xii. n. ix. x. etc. 12 S. Augustine, Enar. Ps. xxxix, n. xiii., Ps. Iviii. ; Ser. ii. n. xxi. ; Ps. ixxxii. n. xxii. ; De civitate Dei, 1. xv. c. xiii. 14 See Migne, S. Scripturӕ, ii. 1329 to 1346, etc. 16 See Goldhagen, De Religione, Hebreorum Dissert. Prop. iii. ; Migne Cursus Comp. S. Scripturӕ, ii. 1041 to 1348; vi. 609; xii. 177 to 181. etc. 17 Exod. xxv. 8, 9. 18 See Migne, iii. 845 to 847, etc. See S. Thomas, Sum. i, 2, q. 102-4; iii. 983, etc. 19 S. Thomas, Sum. iii. q. 22.3.5, etc.